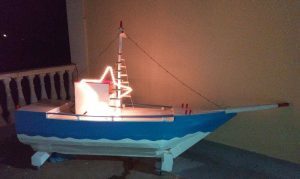 The Christmas Boat is an old Greek tradition known as “Karavaki”, meaning little ship. This holiday tradition still thrives today. In Greece, around the holidays, it is tradition to decorate your boat with lights. If the family did not own a boat, they would use small model boats to decorate. Children carried the model boats around along with musical instruments as they sang carols to their neighbors. Some families would place the model boat near the fireplace or on display at the front door as their Christmas Boat. Boats represent a powerful symbol in Greece of moving towards a new life. It is believed, that the first Christmas tree came to Greece in 1833. This occurred when the country became a royalty and selected a king. Otto von Wittelsbach of Bavaria ruled from 1832 to 1862 as the King of Greece. Bringing the traditions of his country to share, a Christmas tree was placed in the Palace of Othonas each year during the holiday. Although the Christmas tree tradition became popular, many still stuck to their roots and decorate a boat. Holiday lights on the water! The Ft. Lauderdale Winterfest Boat Parade is around the corner.